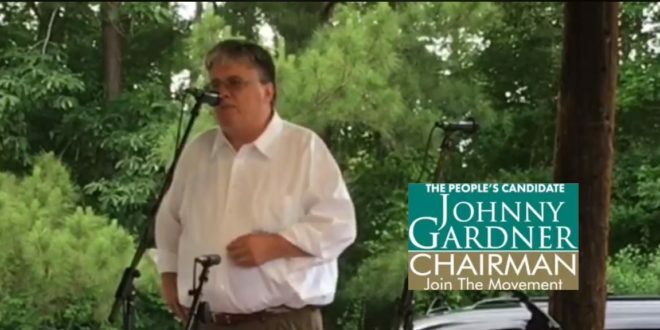 A group of 250 enthusiastic and energized, Horry County policemen, firemen, and county residents showed up in force last night at a Johnny Gardner for Horry County Council Chairmen event held just west of Conway, S.C. Gardner is running for the seat currently occupied by Mark Lazarus. The election takes place county-wide on June 12th. The campaign is finding momentum across the county as residents are concerned about what they consider the unchecked growth of Horry County coupled with current Horry County Council’s lack of concern or planning for such growth. As we reported yesterday, the average response time for a “priority one” police call in the county is over 20 minutes. With the recent home invasion and ongoing burglaries in Carolina Forest, residents are responding to Gardner’s campaign message. Gardner clearly has the support of every day, local families. While his resonance is soft spoken, his message is firmly rooted in putting residents ahead of a broken system that continues to block the necessary quality of life improvements needed in Horry County. ARE POLITICAL RACES HIGHLIGHTING CHAOS? OR CORRUPTION?